Marrying single malt whisky is a tradition we have passed down through generations. Our whisky is matured for 12 years in Olorosso, European oak sherry and American oak casks before being married by our Malt Master, Brian Kinsman, in specially designed, uniquely sized oak marrying tuns for 9 months. Tasting Notes: Characteristic sweet, fruity notes. Develops into butterscotch, cream, malt and subtle oak flavours. Flowing in the Valley of the Deer since 1887, our family's signature expression is the world's most awarded single malt Scotch whisky. With a unique freshness from the same Highland spring water we've used since 1887, its distinctive fruitiness comes from the high cut point William Grant always insisted upon. 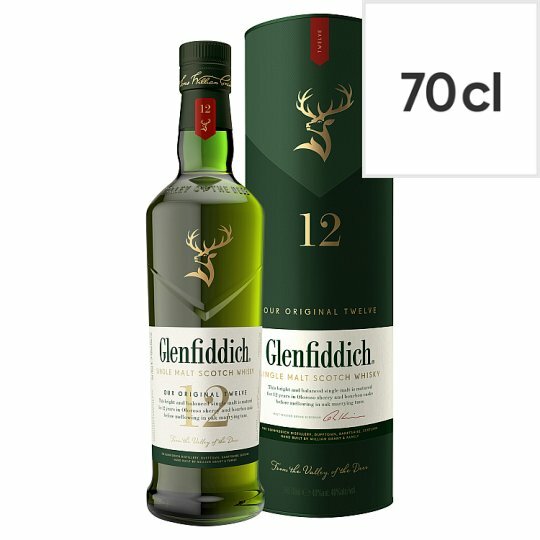 Carefully matured in the finest American oak and European oak sherry casks for at least 12 years, it is mellowed in oak marrying tuns to create its sweet and subtle oak flavours. For 20 years William Grant nurtured a dream to make the ‘best dram in the valley'. With the help of his family, he finally achieved that vision. In the summer of 1886, with his seven sons and two daughters by his side, William set out to fulfil a lifelong ambition. Together they began building his Distillery by hand, stone by stone. After a single year of work it was ready and William named it Glenfiddich, Gaelic for Valley of the Deer. William's passion, determination and pioneering spirit continues to guide us today. Glenfiddich is one of the few single malt distilleries to remain entirely family owned and is now the World's Most Awarded Single Malt Scotch Whisky, a true reflection of our founder's innovative nature, passed down through the generations.